If you haven’t heard of Fran Bow, then where have you been? Fran Bow is a horror themed point and click adventure game developed by Killmonday Games. The game hit our screens in August of last year where it sold 10,000 copies on its first month. Crowdfunding via Indiegogo, it raised up to $28,295. Its success was secured early on, and it was quickly picked up and played by a huge number of Vlogging gamers on Youtube including Jacksepticeye, Markiplier, CinnamonToastKen and iHasCupquake. 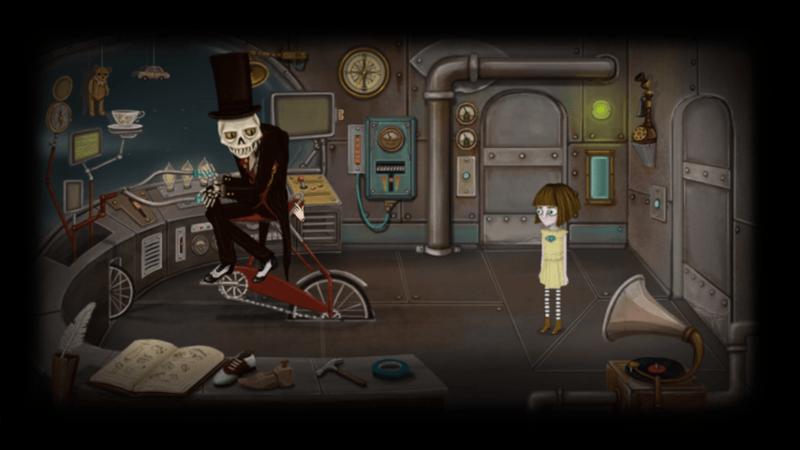 Although at this point we know plenty about the game, we here at MisplacedPixels managed to snag an interview with Swedish director and writer of Fran Bow, Natalia Figueroa. Interviewer: How would YOU describe Fran Bow? Natalia: Fran Bow for me is a journey and how I see life itself. It’s horrific, yet beautiful. I would describe it as an adventure in the shadows of a young girl’s mind, who is broken and alone but that in this journey, she would discover those things that make her happy. Interviewer: How did you find the reaction to the game? Natalia: Unbelievable! I’m so happy to see that people like the bizarre ideas behind Fran Bow and that they can relate to the feelings and the meaning of the characters! We get so many thank you emails and fan arts that it’s crazy! Also on Steam and GOG, gamers are showing so much love with the lovely reviews they make and even the negative comments have been of great help to grow as a director and creator overall! Interviewer: What was the design process like and how long did it take? Natalia: The design process was a crazy one! This is our first big game and we didn’t have experience before, so we got to learn a lot along the way. It took 3 years to finish the game. Interviewer: What problems did you face? Natalia: The biggest problem is money. We did a crowdfunding campaign, which was successful. We raised around 28,000 dollars to make Fran Bow. But even though it can sound as a large amount of money, for a game development, that’s very little money (at least that’s what we learned after, LOL) So at the end of development we were almost not eating, not leaving home ever, because we couldn’t even afford a bus ticket and we were working around 12-16 hours a day. Also, many of the scenes had to be done again, because with time I got better at drawing, so I kind of got to do the whole first chapter again. It was a nice adventure to make this game and the pain is totally worth it. We will continue making games. Interviewer: Favourite part of the game? Natalia: My favourite part of the game is the whole game! I love all the details! I love the creepy and sweet in it. I love the friendship between Fran and Mr. Midnight, so honest and clean. I love Itward and his way of loving, so different to what we usually expect. I love the fact that I can travel through all seasons and see a two-sided reality! I love the Pinezeelou family! (Pinecone family). I really love also the fact that every chapter is quite different from the previous. Interviewer: What elements are important for a really successful game? Natalia: Well, this is my own vision… but I think that if you do something with great care and love, something you really, really like doing… it’s more than a fact that others will like it too. Success is only a word that can be interpreted in many ways. I feel successful mainly because I finished the game, it was a hard trip! Interviewer: What inspired you/your work? Natalia: Inspiration comes from everywhere, but in this case I was mainly inspired by the urge of creating something that portraits what I’ve been feeling since I was young. Deceptions, terror and lack of experience to manage these terrible feelings, to suddenly find myself feeling better when finding my path and understanding my own reality. Interviewer: Do horror movies have any impact on what you produce? Natalia: Some horror movies have been for me an incredibly exciting experience and of course it has impact! Natalia: I don’t like jump scares because they don’t really give me the chills, they just annoy me. Psychological stories tend to be more of my taste, mainly because it creates unease feelings which it’s connected to my own imagination, which I love! Interviewer: Has youtube had an impact on the success of the game? Natalia: Yes, we think Youtubers have helped Fran Bow to get more spotlight. Interviewer: Are you working on anything new? Yes, folks you heard it here first! The developers over at KillMonday are already in the early stages of development! I think we can all safely assume that based on their first game, any future releases by these talented Swedes are a guaranteed success! Did they ever bring it out for ios. Hia Icecube, i believe they did. According to most of the download sites, the game is now available on Android, iPad, iPhone/iPod Touch, Mac, PC, Linux. But I’m not 100 per cent on it. I loved the demo, glad they brought out more platforms. Is it available for mobile gaming?? I really liked this game, has some really unique and unusual themes. Can’t wait to see what they bring out next. I totally agree. I loved the way it dealt with mental health. It was creepy, but in quite a sophisticated manor. It was all very original, while remaining atmospheric. Games seems pretty legit. Might have to buy it at some point. Jackspeticeye’s play through was really good, but i thought it was super weird that pewds didn’t even try to play it. Hope they make this into a movie.. or a TV show on Netflix or something. The music in the tailor was incredible.